Are you ready to go back to school yet? There is always so much to prepare! Getting the classroom ready, mapping out your plan for the year, collaborating with your team, and getting everything ready for the students to arrive are just some of the many things on your to do list. How is a teacher supposed to keep track of it all!? 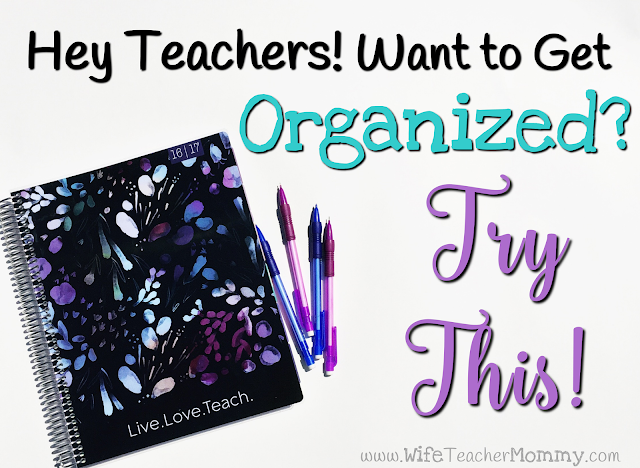 A teacher planner is essential for getting organized! I used a planner to help me stay organized when I was in the classroom. However, I didn’t know much about all the super nice planners that were out there! I just used a very basic planner from the teacher store. Now that I’m staying home with my young children and creating resources, I discovered Plum Paper planners. I use a Plum Paper planner to keep track of everything I need to do for my blog, creating teaching resources, continued education training, AND of course everything that needs to be done around the house! I absolutely LOVE this planner. It has plenty of space for me to write everything I need. It has monthly, weekly, and daily planning. It also includes tons of check lists and to do lists, notes pages, and a monthly page for me to write down my goals and things I need to remember for each month. Not only does it work perfectly for me, but a Plum Paper planner could also be the perfect fit for you! In addition to regular planners, Plum Paper also has TEACHER planners! Shirley from Plum Paper was kind enough to send me one of their Large Teacher Planners to show off to my readers and give away to one lucky person (plus an exclusive Plum Paper coupon code to give to my readers!) I was so excited to get this beauty in the mail! Unboxing the Plum Paper Large Teacher Planner! These monthly goal sheets help you stay focused on your goals for the month! They also help you keep track of things to remember throughout the month such as birthdays and events. Weekly Planning. Fill in your subjects on the left hand side! I LOVE that each week includes a to do list as well as room to write down any prep work that you need to do! Student Contact Information- Super convenient! Student health information. So important to have on hand! Year at a glance. I love all the colors! Classroom Expenses and Passwords. The passwords page is pure genius! I don’t know about you, but I’m always forgetting my passwords to everything! Especially when there are special “rules” for your password or you have to change it every so often! Parent Communication Sheets- I absolutely LOVE this! It’s so important to contact ALL student’s parents from time to time. This includes letting parents know that a student is doing well, and this is often forgotten. This is a good way to keep track to make sure you aren’t forgetting anyone. Behavior Log- This could be very useful! Lots and lots of CHECKLISTS! These can always come in handy. There is a whole section for notes in the planner. There are also 2 notes pages included in each monthly tab as well! As you can see, this planner is such a lifesaver for teachers! The folks at Plum Paper surely thought of everything. The planner is perfect for not only keeping up with planning out your lessons, but also keeping track of information regarding your students (health information, contact information, behavior logs, and birthdays). You can also keep track of your classroom expenses, passwords, volunteers, and professional development. I personally think the Parent Communication Log is brilliant! It is so important to be sure to contact every student’s family so it is such a great tool to keep track as you go. They are also so fun to personalize with your own name, monogram, or even a photo! 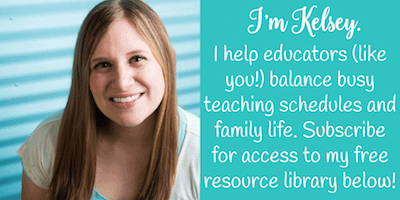 Special Plum Paper Promo Code for Wife Teacher Mommy Readers! If you LOVE what you see and want your own Plum Paper Planner, I have some good news for you! They are one of the less expensive teacher planners on the market (starting at only $41.00 for the large teacher planner). But to make things even better, I was given a special promo code just for my readers! Use promo code KELSEY10 at checkout to save 10% off any Plum Paper Planner Order! This coupon code will work through September 30, 2016. However, if you’re reading this before July 11, you’ll definitely want to enter to win the Plum Paper Large Teacher Planner pictured above for FREE below!! I was so lucky to give away this teacher planner pictured to one of my awesome readers! The giveaway has ended, but if you don’t want to miss out on any future giveaways, be sure to subscribe to my mailing list here! I try to host my own “big” giveaway 3-4 times a year and participate in some giveaways with other sellers throughout the year. You’ll even get access to freebies just by signing up! The package for the lucky giveaway winner! Sorry if there were any technical difficulties or confusion! The entries are not automatic as soon as you send the invite. The entries happen once your friend clicks on your link and enters the giveaway with at least one action. I have seen some come through on my end, so it looks like it is working. Sometimes they don't always refresh on the widget. Thanks for letting me know! I'll try to explain it more clearly next time! The coupon code does not work! Is there another code that I should use?